Since January 26, the stock market is down by over 10%. Don’t overreact - keep recent perspective as well as historical perspective in mind for the markets. Also, perspective on how this might change your overall retirement plan. Let’s put it this way - imagine we met the week before Thanksgiving and reviewed your retirement analysis on planwithpeak.com. All of you know by now that I assume a future investment return of 5% per year when analyzing your future retirement, which is conservative by historical measures but I like to use a low rate for a conservative analysis. So we met less than 3 months ago, and your retirement plan looked good. You walked out the door feeling good knowing that you are track to reach your retirement goals. And now here we are today with exactly the same market value. In fact, last night I met with my dad, who is planning on retiring at the end of the this month. I reviewed his analysis with these newly updated market values, and we are still good to go on pulling the trigger on retirement this month. I would also like to add that my mom retired in September 2007, just before the financial crisis meltdown and she is doing just fine a decade later. Thinking about the losses over the last week is not fun, but at the same time, for most of you it is unlikely that it will affect your long term goals. If you would like to know specifically, send me an email or give me a call and I can update your analysis for you. Remember, you have access to view your plan online at home as well on planwithpeak.com. Now that I’ve address your own retirement plan, how about perspective on the recent market action? We’ve erased December and January and half of November stock gains. What’s really changed since then? We are actually seeing more growth and better corporate earnings since the last quarter, which has led to higher interest rates and higher expected inflation which we saw in last weeks jobs report. As the economy has improved, people are making more money and getting raises. This can lead to inflation and higher interest rates. A spike in interest rates quickly is scary for the stock market. So that might be a big part of it. Antoher part could be that over the past couple months the market got ahead of itself. Let’s take a look at some historical perspectives. The market generally experiences 5% drawdowns 3x per year on average and a 10% correction 1x per year on average and a bear market which is a 20% drop every 3.5 years on average. We haven’t seen a 5% or a 10% correction since January 2016, which was a great buying opportunity. We haven’t seen a 20% bear market drop since 2011. So based on historical averages, we were overdue for one of these drops. The S&P 500 went 404 days without a 5% correction, which is the longest ever. This one happened pretty quick, which makes it feel even worse. Furthermore, not only have we not experienced these drawdowns, but we have had record low volatility over the last year - only a couple days where we moved up or down 1% and now it seems like all the volatility has hit us all at once in the past week. Perhaps we are dealing with that pent up volatility. To drop 10% in one week is rare. The last time that happened was in Sept 2008 when we lost 20% in one week where Merrill lynch, Bear Sterns, Lehman brothers, AIG, Washington mutual, and many others either went out of business, were forced to sell themselves, or were forced to take federal bailouts. This is nothing like that. Back then companies were insolvent and today we are experiencing record earnings for companies. I spend a lot of time talking about risk with my clients and what they are comfortable with on the downside. As a result I don’t believe any of you are invested too aggressively. If you would like to see if your risk tolerance has changed, please take the Riskalyze quiz. The results will be automatically sent to me. Is the economy still ok? 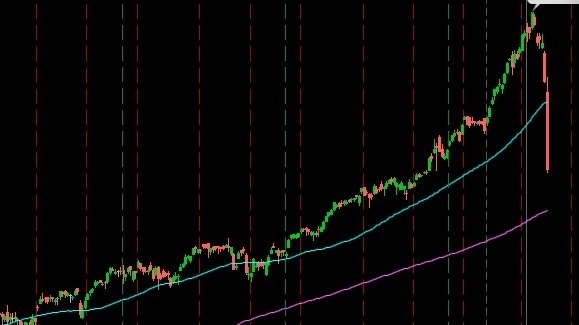 Are fundamentals still ok? Remember, your economics professor taught you that corporate earnings are the most important driver of the price of a stock. So far this quarter, about half of the S&P 500 companies have reported earnings with revenue growth of 7.7% year over year and earnings per share growth of 13.6% year over year. Looks pretty healthy if you ask me. Fourth quarter GDP growth was recently released at 2.6% growth, and the first quarter 2018 is forecasted to show over 5% growth by the Atlanta Fed. If you have time and you’re aggressive, a 10% correction could be considered a good buying opportunity. Email [email protected] or call to discuss. Make sure you’re not taking too much risk in the first place. Click here to take the Riskalyze quiz. I will reach out to you after you take it. Let’s update your planwithpeak.com retirement analysis and make sure you’re still on track. It helps to have long term perspective to avoid making an emotional decision in times like these. Still feeling stressed? Call me at 734-681-7575. We are your peace of mind.